¡Viva Fiesta, Viva La Vida! April in San Antonio means one thing. Fiesta! As part of the Fiesta festivities this year, Donate Life Texas joined University Health System’s Circle for Life Motorcycle Ride, a fundraiser for the hospital’s Transplant Center patients. 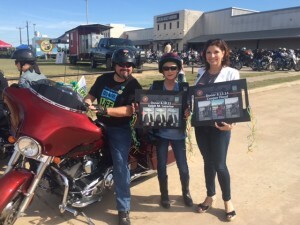 Adorned with Donate Life flags, bikers embarked on a scenic 64-mile ride through the Texas hill country as a two-wheeled salute to the lives touched by the selfless gift of donation. That morning, riders also saluted Donor Family Honoree Christine Floyd who shared the story of her son, Cooper who became a donor in 2014. 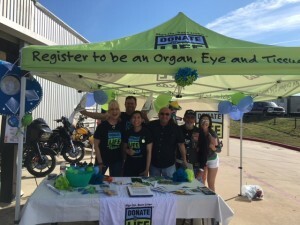 Meanwhile, Texas Organ Sharing Alliance & GenCure volunteers hosted the Donate Life Texas tent to help attendees join the donor registry and hand out commemorative patches to participants. 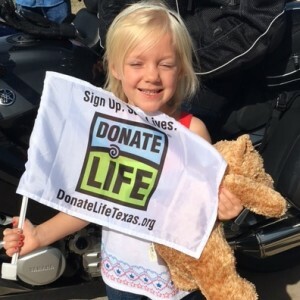 By the end of the day, 93 people had either registered for the first time or confirmed their existing registration by showing the Hero’s Heart donor symbol on their driver’s license. The day of the ride was capped off with the Fiesta Flambeau Parade which included a walking entry honoring eight Donor Families and Transplant Recipients. 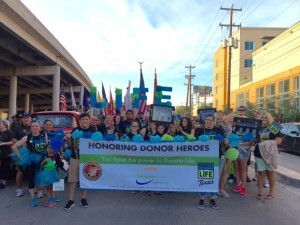 Decked out in bright Blue & Green and carrying letters spelling “Donate,” these Honorees were a festive tribute to their loved ones and Donor Heroes, celebrating the life donation makes possible. In fact, their high spirits were even noticed from one Fiesta-goer who posted to our Facebook page from Washington! Circle 4 Life – Sign Up. Save Lives. Ride On! 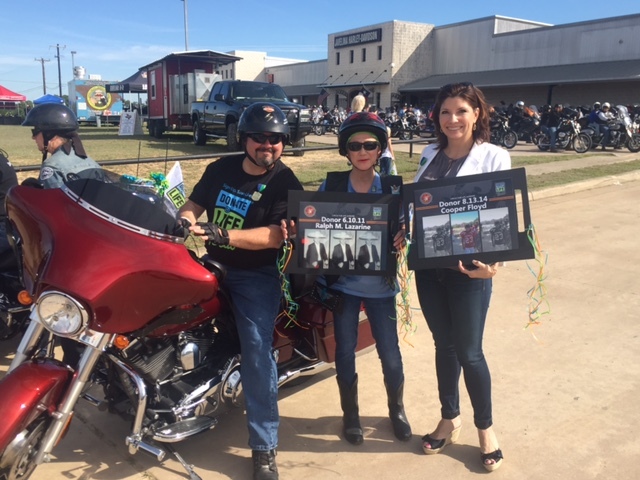 Donor Family Honorees, Christine Floyd & Deborah Cotter inspire riders with their loved one’s stories. TOSA & GenCure Volunteers signed up or confirmed almost 100 donor registrations!